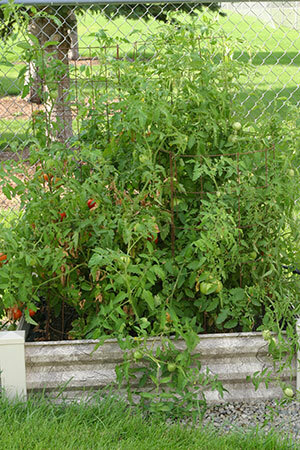 Here is one tomato bed–huge and green towers of tomatoes. Unfortunately, I didn’t remember which plants I put where, and got my tall and short towers mixed up. This is my other tomato bed. It’s so strange, because these were all treated the same way, but these plants are quite a bit smaller. Still, they are producing tons of tomatoes, so I’m not complaining. 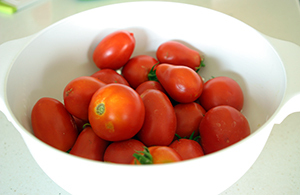 Here is my first tomato harvest. Aren’t they beautiful? And here is what I picked yesterday. Note that the bowl in back is the same as in the photo above. 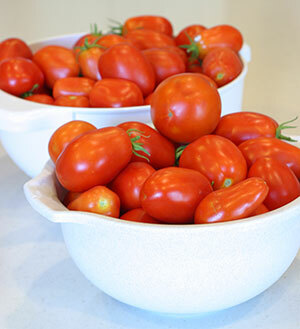 More than twice as many–salsa time! I have pulled the peas and lettuce out of this garden, but still have kale, green beans, a few onions, and collards growing in the middle. On the left side I threw in some sunflowers. I was hoping the trellis would help support them. They’re just getting tall enough to reach it, so we’ll see if it was a success. On the right are my cucumbers and baby pumpkins. they are starting to grow up the trellis now–I planted them rather late. 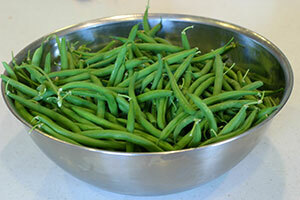 Here are the green beans I harvested last week–enough to serve for dinner. And this is what I picked yesterday–4 1/2 pounds! As you can see, most of my onions have fallen over naturally. It’s interesting–the ones still standing are planted from transplants (tiny little onion plants) instead of sets. I have pushed them over so they will be ready to harvest soon. 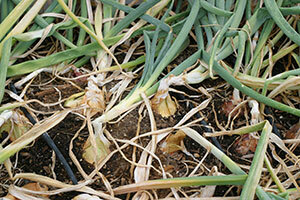 This is a close up of what my onions look like in the garden. 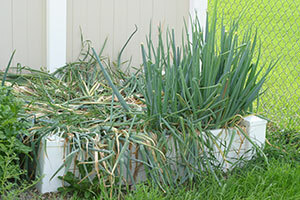 I have to say, that usually my onions are ready WAY before my tomatoes, so I am liking the Walls O Water I used! On the left are pumpkins, and the right is zucchini. I have picked one zucchini (hurray) and made a delicious zucchini lasagna (recipe coming soon). The brown stuff in front is cilantro that I’m letting go to seed so I can collect them. 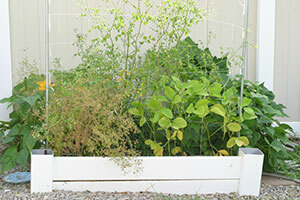 The middle is a cherry tomato that never recovered from spring trauma, and the right is soy beans. I’ve never grown them, and I planted them late. They look really yellow, so I’m going to look into fertilizing them. Also in this bed are a few green beans and carrots. This bed has my peppers, eggplant, and potatoes. 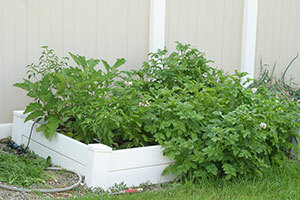 As you can see the potatoes keep trying to take over. I’ve dug up a few for dinner, but to my surprise they keep flowering and growing like crazy. Here is my first harvest of peppers (bell, Anaheim?, and jalapeno). The middle ones are definitely hot, but they don’t seem big enough to be Anaheim to me. Since then I’ve picked 3 Big Jims as well. 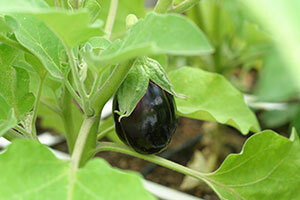 This is my first year growing eggplant, and here’s my first fruit. I’m so excited! I need to get on the ball and replant for fall. And can salsa. And freeze green beans. Summer is coming to an end! 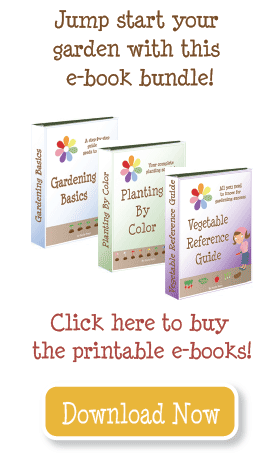 If you go to my posts you can see pictures, and garden plans. My backyard faces south, and my beds are on the east and west fences. Some get morning light, others afternoon light. During the summer the sun is so high in the sky, the fences hardly shade the gardens at all. There are no trees or other things to cast shade. I’d like to know which way is South for your beds, Emily, sun hours, etc. I am in zone 6a or 6b, I think. Everything looks great!! What zone do you live in? 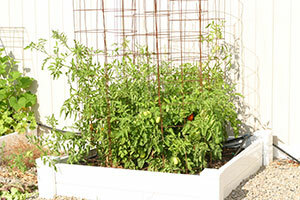 This is my first year with SFG and my tomatoes are doing good so far. Only have one bell pepper (transplant), not sure if I will get more =(. I might add another box next year. 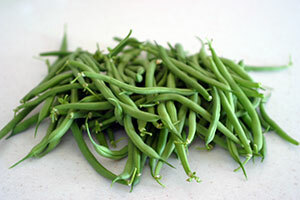 I am in zone 5, so not sure what I should be expecting to be harvested, my onion seed packet say 110 days, that would be in Sept.
what variety of green bean do you plant? 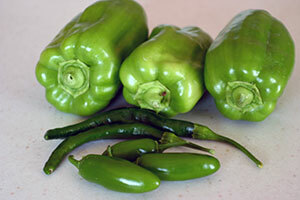 Those peppers in the center of the picture of bells and jalapenos are called Serrano chiles and yes, they are hot. Make sure you wear gloves when handling and prepping – you’ll never forget it if you don’t, and then touch your eyes! Congratulations – very nice work. I’ve harvested some pink brandywine seeds and some cherokee purple seeds (both are heirloom tomatoes and my 2 favorites) and I will have plenty of extras. The pink brandywine are so sweet without the sour bitter after taste most tomatoes have. 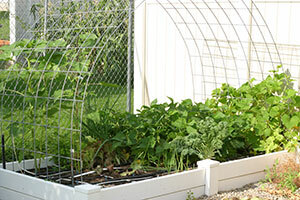 I know the seeds grow true to form because I harvested the seeds last from last year’s plants and they grew into 8 feet tall plants – I need a new trellis. Want some seeds? Your garden is glorious!!! I can’t say I’ve had much luck with my SFG, but I’m not giving up! Enjoy your harvest!